Hi all, I'm pretty new to the forum. This is my second XJ, the first was a 97 I purchased about 9 years ago and sold 5 years ago so my wife could get an SUV. 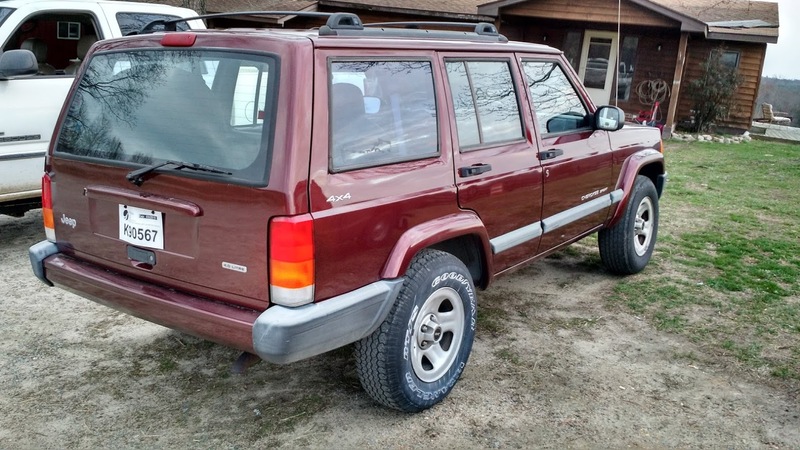 I missed my XJ for years and then by chance I ran across this 2000 XJ and after looking at it, paid the man and drove off in my new (to me) Jeep. I wasn't sure if I'd gotten a good deal or not but everything looked almost to good to be true. 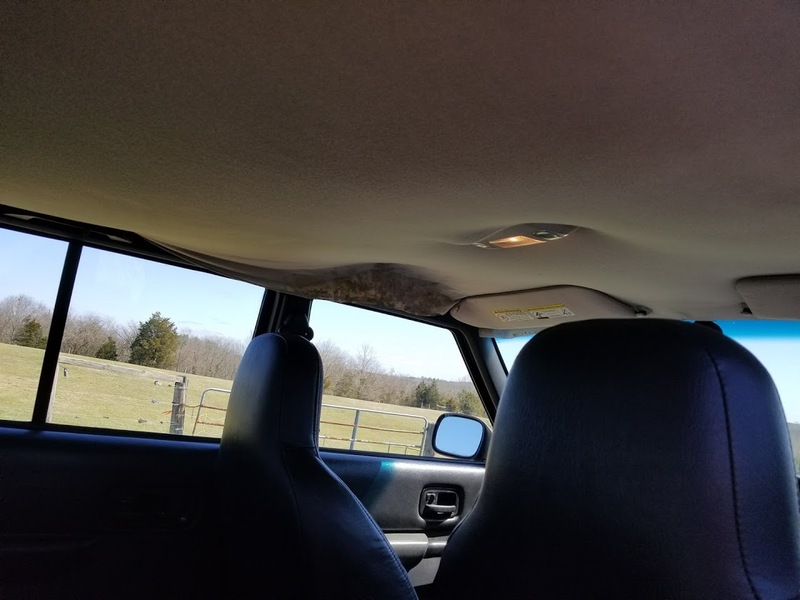 It had been repainted at some point back to factory burgundy, the interior was in excellent shape with a few exceptions like the headliner sagging and the carnage left from someone installing a CB in the center console (good idea, poor execution). The inspection sticker was new, paperwork in hand from a fresh oil change, the tires held air and had tread but were starting to show dry rot and there were 3 different tread patterns. Exterior molding was faded but I didn't care that much about that. The test drive was fine, engine was smooth and quiet, steering pulled to the left but didn't seem to have much play. 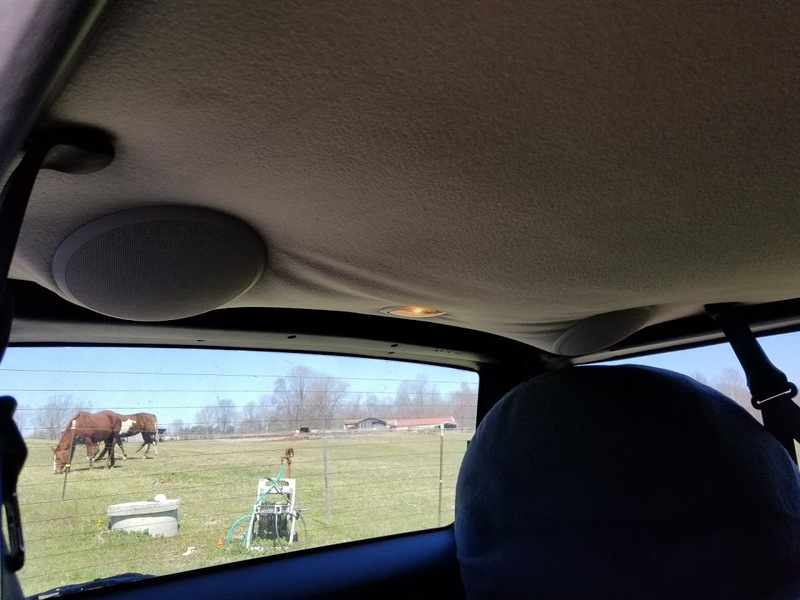 At 50mph it would start to give some vibration that stopped at about 55mph. I gave the man the money and drove home. I decided I had to have tires and an alignment. I want to lift the XJ and add many mods before the end but I'm restraining myself and making a plan. First order of business needs to be reliability and just making sure everything works right. It's gonna be a slow build for me (I'm guessing 2-4 years to satisfaction) so rather then start with lift, I'm starting with making it solid first. 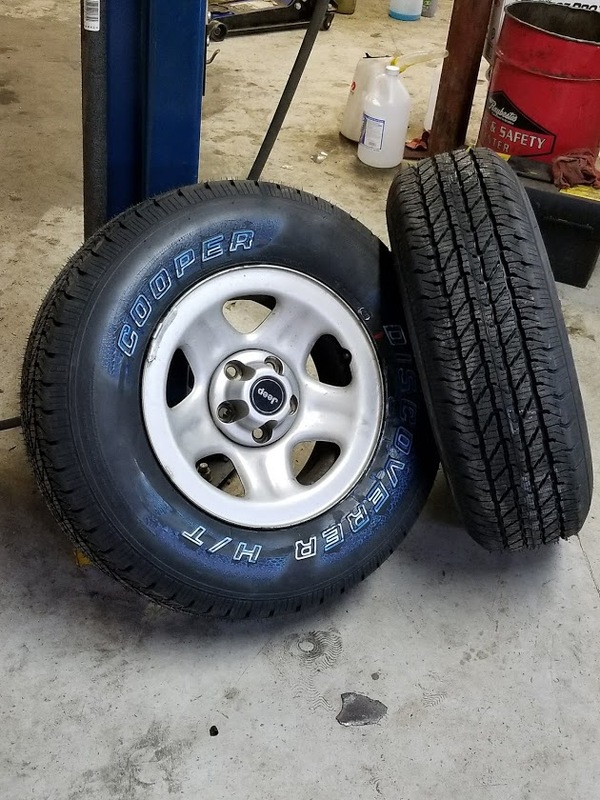 So... a brand new set of Cooper Discovery H/Ts to hold me for the next 24 months while I work over the wiring, body, frame, and powertrain finding and fixing all the assorted issues it's developed in it's 18 years of life. Along with the tires came a front end alignment and because my local shop is really nice they always let me go back and get up under my vehicle while it's on the lift and look, yank, and wiggle anything I want to see what's up. My expectations were unibody rust, leaking axle bearings, play in the steering, leaking pinon seals, bad u-joints, pinon slop, etc. 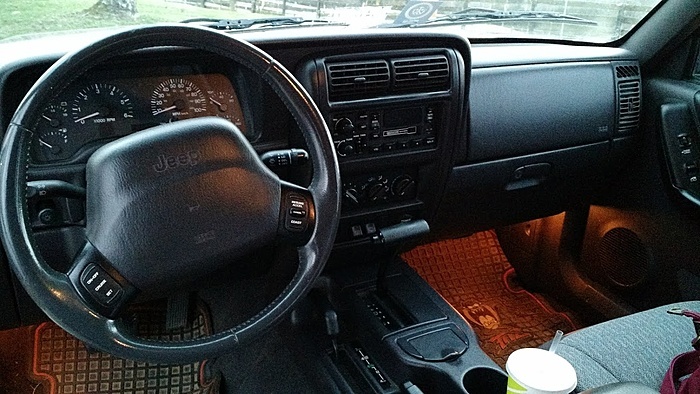 All the things you find wrong with old jeeps. What I found instead was this. 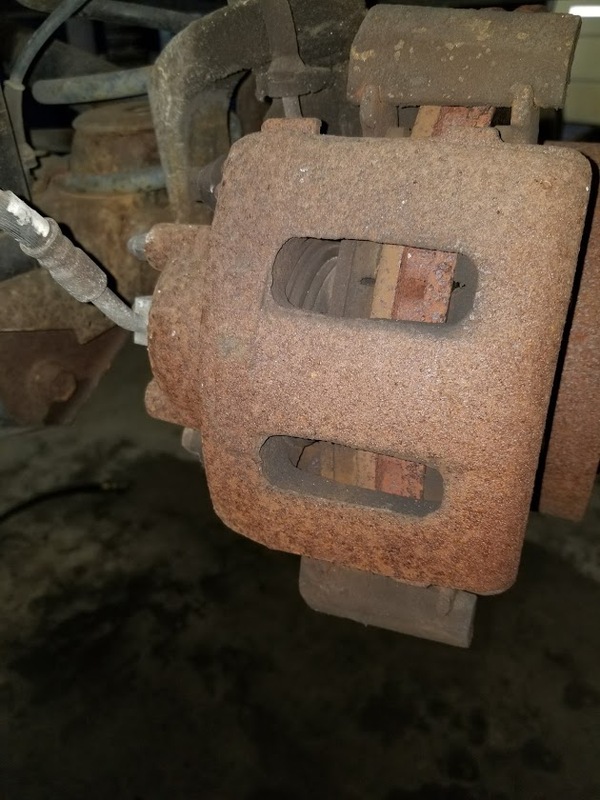 Even the brakes were in good shape. Next to no rust anywhere on the body and unibody, surface rust on things like the axles and such was about it. no leaking seals that I could see, very little pinon play, u-joints were in good shape, and all 4 shocks had been recently replaced and the rear upper shock mounts had already been modified CORRECTLY to eliminate the studs that always break. 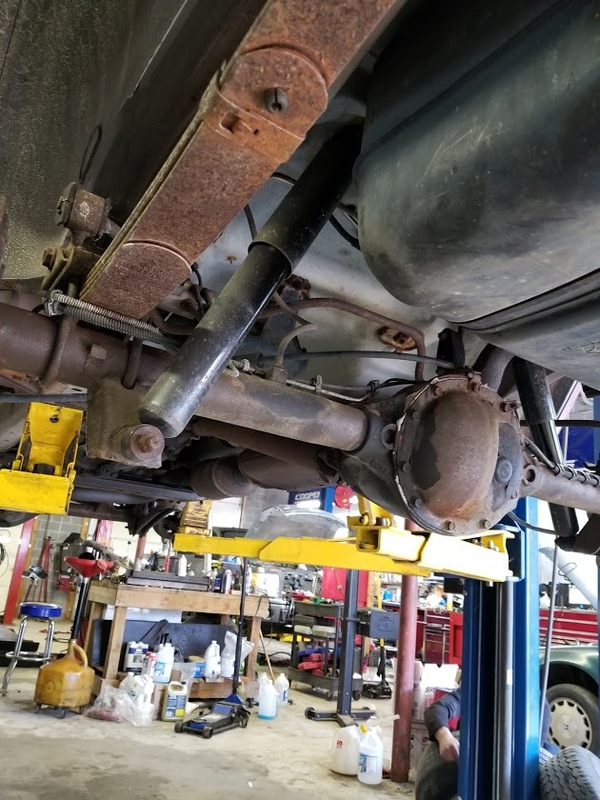 My only sad moment was finding the Dana 35 rear axle, but I can swap that later. This post is already getting pretty long so I'll unveil my master plan in more detail in a later post but the basics are make is solid, 4.5" Rusty's Offroad Long arm kit, fender flares and 33" or 35" depending on what fits best, rear axle swap, possibly a front axle swap, roof rack, front and rear bumpers, rock sliders, body armor, swap the NP242 for a NP231 with Teraflex 4:1 and SYE, and most importantly DECALS! Let me know what y'all think and if I found a good deal or got taken. I paid $3400 for it, 124k miles. I've put about 1500 miles on it and it doesn't leak, smoke, or heat. 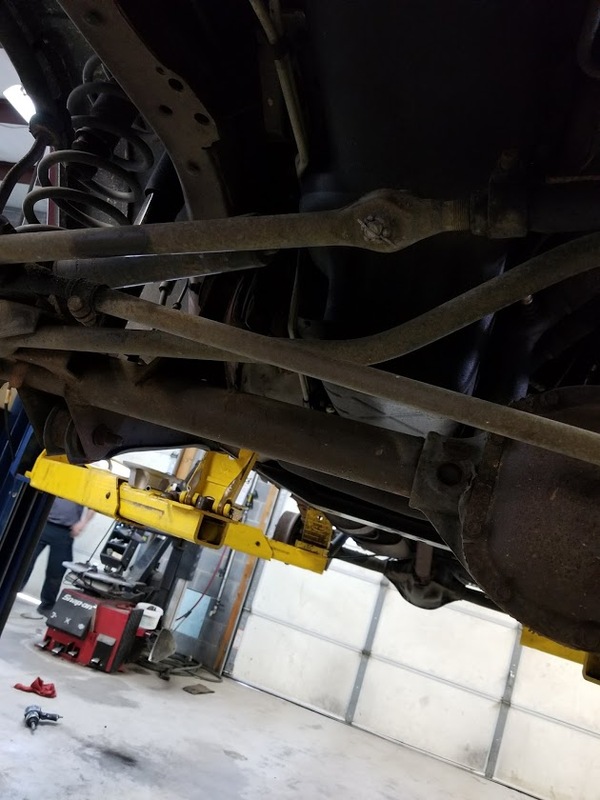 Pre 2000 exhaust manifold on 2000+ head? 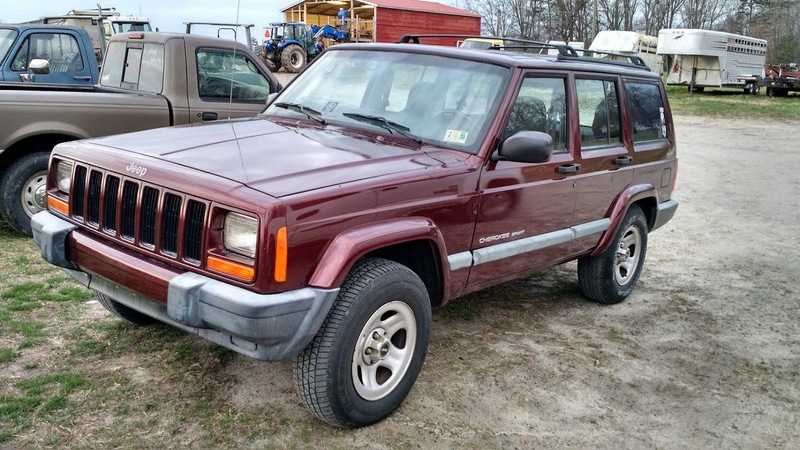 Bought a 2000 Cherokee 4.0 engine, got a 2000 tj 5.0. Can it work? 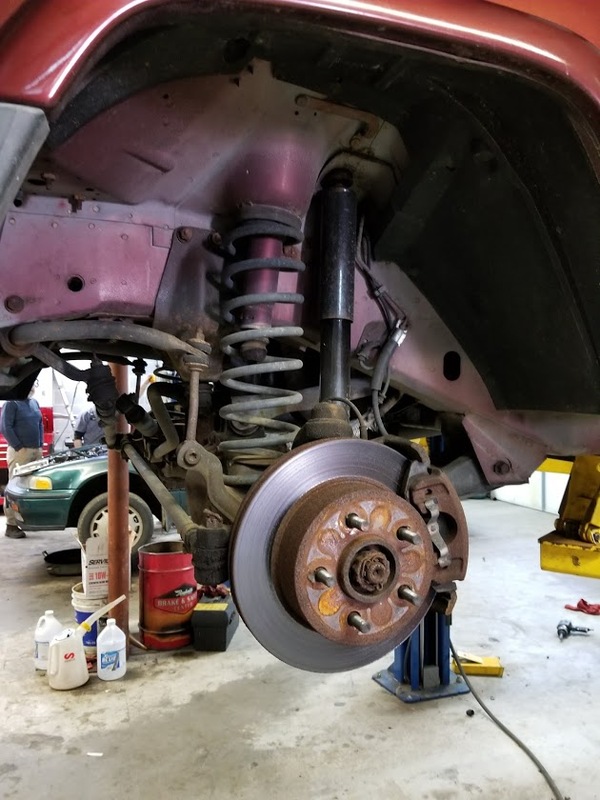 Quick Reply: 2000 XJ "Spoingy"